A cool must-play for RPG fans whove not tried it before, and a warming flashback for those who have. What is it: Classic RPG from the Infinity engine era. From the very first moment you meet it, Icewind Dale grumbles through its frozen beard that ‘I am going to be a old-fashioned pen and paper RPG’. It starts as your six adventurers, drinking around a table in the tavern of Easthaven, are approached by a mysterious stranger to go on a quest… cue a ramble across Icewind Dale, the frozen north of Faerun, the land of the Forgotten Realms book series, with a plot that acts a preamble to R.A. Salvatore’s so-so Icewind Dale trilogy. 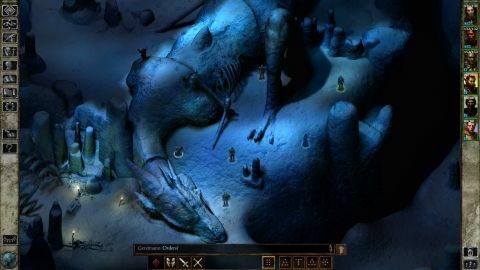 For those who’ve not played it, Icewind Dale is an infinity engine game, just like Baldur’s Gate and Planescape Torment. Yet, where those games had epic branching storylines and finely-sketched characters, Icewind Dale is more restricted in its ambitions. Similarly, the Enhanced Edition is more limited in its additions. This version is a minor improvement on the previously complete edition of Icewind Dale (available from GOG). It adds a touch of cut content (restored mainly thanks to a persistent modding community called Gibberlings) and imports the much larger variety of equipment, classes and class kits from Baldur’s Gate. There are also useful additions like the ability to skip dialogue, an essential loot-finder tool, and a zoom function so you can fit more of the game’s beautiful hand-drawn backgrounds on your screen. Finally, there’s a new cross-platform multiplayer mode, allowing you to play with friends on their phones and tablets. Anyway, following on that ‘mysterious quest in a pub’ RPG promise, Icewind Dale is as close to Diablo as Baldur’s Gate. Much of the game is spent killing. Killing skeletons, yetis, orcs, goblin, giants, thieves, umber hulks, salamanders, trolls, monks, golems, zombies, lizardmen, yuan-ti, mummies, shadows and liches. Amongst others. Unlike modern games, they really didn’t skimp on the monster types in ye olde days, and there are several tough battles that will require careful planning and character management to survive. Where they did skimp was on the characters. Unlike the earlier infinity engine games, you don’t get interactive characters or inter-party dialogue or plot from your party members here, nor can you recruit more as the game goes by. You generate them right at the start, use pre-generated ones, or import ones from other games. It’s recommended you start with six new characters, but given the way it doles out experience, it’s perfectly plausible to start with just one or two and level them up fast. These characters of yours travel out from the great druidic tree of Kuldahar to explore why its warming aura is fading in the snowbound lands of Icewind Dale. Though in description the story seems rich enough, it mainly consists of killing lots of people in a whistle stop tour of Faerun’s minority factions. Occasionally, you get to talk to them before you kill them. Thankfully, there are the usual endless Black Isle sidequests, varying from rebuilding an Elven arboretum to repeatedly rescuing villagers, which add a little more flavour to the world. Black Isle’s (Obisidian’s) dialogue is as witty as ever, and the depth of NPC responses to different character classes adds to the already-enormous replay value - though given the weakness of the story, we’d balk at playing it on the Story mode where your party is invulnerable. There are other, minor problems. I never understood the D&D THACO combat system and it’s still obscure and unexplained here. Though the imbalances in it are fun, being unable to kill a boss because none of my magic weapons are +3 is daft. Similarly, though the new autoloot helps with finding items on the ground, you’ll still have to pixelhunt to find switches and crucial loot containers. And quicksave before each battle, because the jaunt to find a priest to resurrect a fallen character is always tedious and autosaves aren’t generous. The biggest problem with this Extended Edition is that the original, despite being slightly buggy, is still completely playable, especially the GOG edition; this isn’t one of our much-vaunted treasures like Ultima Underworld or Arcanum: Of Steamworks Obscura that simply aren’t much fun to play these days because of interface, control and/or resolution issues. The infinity engine established many of the modern expectations for RPGs, so it’s not surprising that a later game like this still just works. One suspects that this version has been rejigged mostly so it can be released on iPad, and the PC release is an incidental benefit. Yet, despite being only a minor advance, this is certainly the definitive version of Icewind Dale. That itself is a fun, tough quest that brings back nostalgia for the beauty of the engine and combat system of those days. That makes it a nice stopgap between here and Eternity.